Ynet reported today that The Anti-Defamation League (ADL) on Monday criticized rock star Roger Waters for simply conveying the truth. 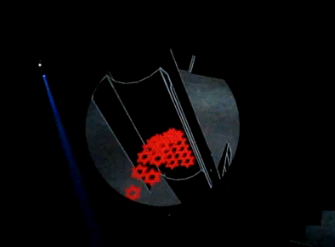 During Waters’ performances of “Goodbye Blue Sky,” in Toronto, an animated scene projects images of planes dropping bombs in the shape of Jewish Stars of David followed by dollar signs. It should be noted that the clip also displays bombs in the shape of crosses, Muslim crescents and a fuel company's logo. We had better face it once and for all: artists are often significantly far ahead of our corrupted ‘liberal’ politicians, who, for some reason, keep silent instead of confronting the Jewish State. The truth needs to be told: Israel is the Jewish State and, actually, it does drop bombs from airplanes decorated with Jewish symbols, and those planes are flown by Jewish pilots. I am perplexed by Foxman’s comment. There is not actually much room for interpretation here :the facts are well established. The U.S. is providing Israel with at least $7.0 million each day. This is a lot of money -- especially when it converted into bombs and white phosphorus. The Israeli war crimes are also established : I advise Foxman to read the Goldstone Report. "Of course Waters has every right to express his political views about the Israeli-Palestinian conflict through his music and stagecraft. However, the images he has chosen, when put together in the same sequence, cross a line into anti-Semitism,” said Foxman, "We wish that Waters had chosen some other way to convey his political views without playing into and dredging up the worst age-old anti-Semitic stereotype about Jews and their supposed obsession with making money." May I suggest to Foxman and his notorious ADL that the rest of humanity also has a wish : we want to see an end to the terror imposed by the Jewish state, in the name of the Jewish people, Foxman included. We also want to see an end of Jewish institutional pressure being exercised on so many Western political groups, parties and governments. If Foxman is really concerned about anti-Semitism, he would do far better to tackle the real root causes of anti Semitism, by confronting Israel and its lobbies about their policies, and he might think of leading world Jewry to do the same.